Former Red Sox manager Grady Little was hired Tuesday to manage the Los Angeles Dodgers, who had been without a field boss for more than two months. The 55-year-old Little beat out Jim Fregosi, John McLaren, Manny Acta and Joel Skinner for the job. He succeeds Jim Tracy, who parted ways with the Dodgers on Oct 3 -- the day after the club completed its second-worst season since moving west from Brooklyn in 1958. With spring training just two months away, the Dodgers are behind every other team in trying to get ready for opening day. "I feel like we have a long time," Little said after being introduced by general manager Ned Colletti and special adviser Tommy Lasorda. "The last job I took on, we had two weeks before opening day." 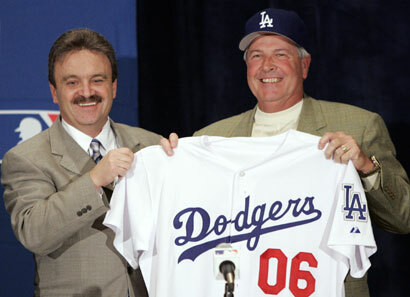 Little was speaking about his hiring by the Red Sox in March 2002. "I think that's terrific for Grady, and wish him great good luck," Red Sox president Larry Lucchino said at the winter meetings in Dallas. "He's not exactly a Hollywood, LA type of guy, but he has a kind of versatility that will hold him in good stead." Little laughed when told of Lucchino's comments. "Heck, is that the same guy that thought I was going to fit in in New England," he said in his Texas drawl. "I'll probably fit in as well as the ballclub does while I'm running it." Little said he didn't dwell on the Yankee Stadium collapse or the harsh commentary in Boston, where Web sites sprung up with names like "Surviving Grady." "That's New England and it's Boston," Little said. "All they want to do is win, and that's all we were trying to do." Little managed the Red Sox in 2002-03, compiling a 188-136 record. He was second-guessed for leaving starting pitcher Pedro Martinez in too long in Game 7 of the 2003 AL championship series, which the New York Yankees won in 11 innings. Little said at the time that if he had to do it over again, he would have left Pedro Martinez in to pitch the eighth inning of the fateful Game 7, when the Yankees rallied from a 5-2 deficit to tie the score off Martinez. But more than two years after Game 7 -- when he was asked just two questions, both about leaving Martinez in -- the same questions are being asked. "That was in the past the day after the season was over, as far as I'm concerned," Little said when asked about it again on Tuesday. "We know where that organization was when we got there, we knew where it was when we left. ... I had confidence in what I did for the ballclub in Boston, but at the same time you never know what's in your future. The opportunity is here now." Little left the Red Sox when his contract was not renewed after the 2003 season, which was the last year of a two-year deal he signed in March 2002. The Red Sox won 93 games in '02, 95 in '03, when they also won the American League wild card. The team held one-year options on him for both the 2004 and 2005 seasons, but in March of 2003 they told Little they wanted to wait until the end of that season before deciding whether to exercise those options. "I know that wherever I go, I'll do the best I can," Little told the Globe's Gordon Edes in Oct. 2003. "I know what we did there. I'm sorry the results of one decision caused so much pain, and it sure helped sell a lot of papers. I feel bad for it. But gol'dang, I can't turn back the clock and make another decision, not knowing whether the results of that decision are good or not." "Everyone knows the final results," Little said about the 2003 season. "We didn't win the World Series, so we lost. I'm only thankful that they're pointing the finger at me, and not at a player, because I can take it. I'm telling you that right now." Little was asked if Martinez spoke with him after the Game 7 loss. "He came and gave me a big hug and thanked me for the opportunity, just like a lot of other players did," Little said. Little said, "To tell you the truth, this ain't bothering me like it's bothering a lot of other people. I'll tell you right now, I did the best I could do, and I still think [his handling of Martinez] was right. Baseball people think that -- maybe not Red Sox fans -- but baseball people tell me over and over. "But in Boston, it's not just this one decision, or just one game. It's like this in May. People are talking about devastating losses, and it's the end of April or first of May. That's serious stuff. You don't play 162 games. You play 162 seasons a year. Every game is a season. That's why this doesn't affect me like it does a lot of people." "If Grady Little is not back with the Red Sox, he'll be somewhere," Little said. "I'll be another ghost, fully capable of haunting." The Chicago Cubs hired Little in January 2004 to be a scouting consultant and assistant to general manager Jim Hendry. Little spent last season as the organization's roving catching instructor. The Dodgers began their managerial search after Tracy left, but Paul DePodesta was fired as the team's general manager Oct. 29, just as his search was winding up. Ned Colletti was introduced as DePodesta's successor on Nov. 16, and interviewed Fregosi three days later. Colletti met with Little, McLaren, Acta and Skinner last week. "It's with a lot of due diligence that we came to this decision," Colletti said. The Dodgers were 71-91 last season -- one year after going 93-69 to win their first NL West championship since 1995.